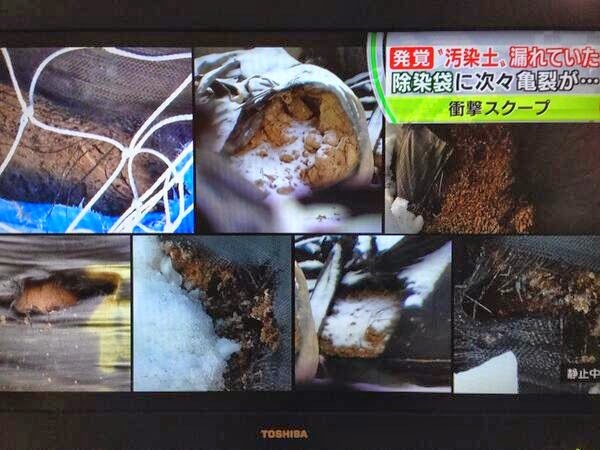 TEPCO says "as a precaution". It looks ALPS Line B wasn't removing enough all-beta. The multi-nuclide removal system ALPS is still on the extended "hot" test run using the waste water, treating less than 200 tonnes of water per day. ALPS comes after the desalination (reverse osmosis) that comes after the cesium absorption by either SARRY or Kurion. These systems before ALPS haven't stopped. The water processed through SARRY/Kurion and reverse osmosis goes back into the reactors to cool the corium, and ALPS is to treat the waste water that is high in all-beta. Even if ALPS is stopped, the water treatment and cooling the reactors continue. We've been conducting the "hot" test of the multi-nuclide removal system ALPS using the waste water after it is processed in the contaminated water treatment systems. Today (3/18/2014), one of the three lines, Line B, has been stopped at 12:04PM to acid-clean the filters. Also today, we noted that the nuclide analysis of the water treated by Line B (collected on March 17) showed all-beta to be [in the order of] 10^7 Bq/L [10,000,000 Bq/L]. The water before entering ALPS has about 10^8 Bq/L [100,000,000 Bq/L] of all-beta, so there is a possibility that the treatment by ALPS is not adequate. As a precaution, we stopped Line A at 1:38PM and Line C at 1:39PM. Strontium-90, a beta nuclide, is mostly removed in the pre-treatment process of ALPS that uses iron coprecipitation and carbonate coprecipitation. TEPCO hasn't found what part of ALPS may be malfunctioning this time. For my post on why ALPS may already be obsolete, click here. Or rather, mainstream media outlets like TV Asahi has waited three years to tell us about what many of us suspected from the beginning. It has been a sad, familiar sight of bags upon bags that contain contaminated soil removed from people's homes, roadsides, gardens, parks, schools, farmlands, etc. 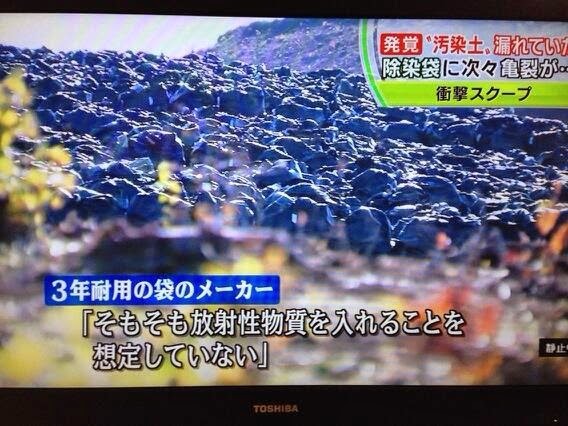 in Fukushima Prefecture and areas in Kanto Region for the past three years in the name of "decontamination". This is supposed to be "news", or "scoop" by TV Asahi. At Fukushima I Nuclear Power Plant, there are a finite number of those huge tanks that are riveted together with the liner that was meant to last for 5 years but deteriorated in only two years. They are slowly being replaced by the welded tanks. But these countless, seemingly infinite black plastic bags of soil that contain radioactive cesium whose half-life is 30 years, not 3? I wonder who came up with the idea to put the removed soil in these bags to begin with. Now it is the 4th year since the start of the nuclear accident, and it feels Year 4 is just as relaxed as Year 3, Year 2, and even Year 1. (OT) New "Cold War" Between the US and Russia: US Will "Calibrate", Russia Will "Incinerate"
"Russia is the only country in the world realistically capable of turning the United States into radioactive ash," Kiselyov said standing in front of a large screen depicting a mushroom cloud produced by a nuclear explosion. "Americans themselves consider Putin to be a stronger leader than Obama," he said. "Why is Obama phoning Putin all the time and talking to him for hours on end?" 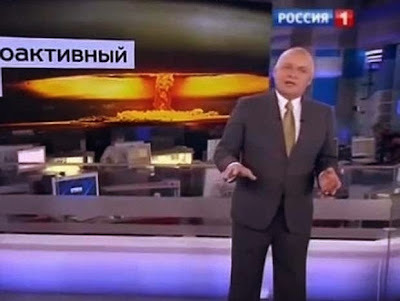 Kiselyov suggested President Obama's hair is turning grey because he is fretting about Russia's nuclear capacity, which could turn the US into dust. "We are going home. Crimea is in Russia"